In stock - low quantity. Order in the next 11 hours, 22 minutes and it will go out today! Comedy magic with surprise endings are great choices. The Sneaky Snake card trick, is so much fun. The snake steals the show and you control the fun. Sneaky snake grabs two innocent cards from the deck, he is ordered to drop one of the two immediately! You now struggle to pull the remaining card from his jaw finally the card is free from danger. When you look at the card you will be amazed because it is the selected card which now has two bite marks through the card. 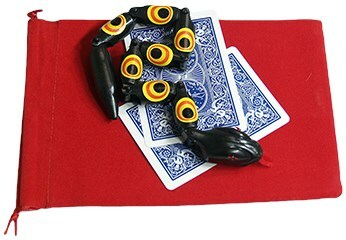 Comes with a Bicycle Poker deck of cards, gimmick, the star of the show Sneaky Snake, and a velvet bag.